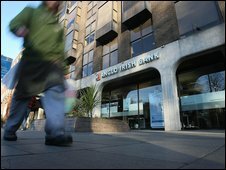 The Irish government has said it is to nationalise the Anglo Irish Bank after its funding problems continued. The state had planned on pumping 1.5bn euros (£1.4bn) into the bank, but has decided that recapitalisation is not the way to secure its future. Anglo Irish has about 100bn euros on its books, but there was no need for customers to act, the state said. It added that all employees would stay with the firm and that shareholder rights would be protected. The bank's board said it would work with the government to ensure its long-term commercial viability. Ministers had been due to hand over the 1.5bn euros bail-out in return for 75% shares with an annual fixed dividend being paid to the government of 10%. "In the current circumstances the State is the only available potential owner," the government said. "I would again stress that this government decision safeguards the interest of the depositors of Anglo, and the stability of the economy, given the significance of Anglo in this regard, as already recognised by the European Commission," said finance minister Brian Lenihan. "The bank will continue to operate as normal and depositors and creditors should continue to transact as normal." A lack of liquidity has made it increasingly difficult for the banks to lend money to their customers. And confidence in Irish banks has been undermined by the global credit crunch. They have been especially badly hit by a slump in the Irish property market which has led to a collapse in the value of investments linked to the property market. In October the government of the Irish Republic acted to shore up its financial system by guaranteeing all deposits in the republic's banks and all money borrowed by the banks from other financial institutions. This led to many savers in the UK putting money there as it came before the UK government had boosted its protection for savings. According to latest figure released at the end of September, 50% of the money saved with Anglo Irish came from UK customers. Anglo Irish recently lost top executives over a secret loans fiasco. In December the bank's chairman resigned after a 87m euros loan controversy. Sean Fitzpatrick confirmed that he had transferred millions of euros out of the Dublin-based bank's accounts. Chief executive David Drumm announced his resignation shortly afterwards.